Ruins of the Temple at Sivasamudram. 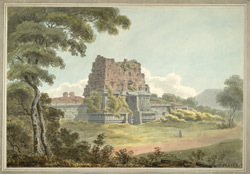 bl.uk > Online Gallery Home	> Online exhibitions	> Asia, Pacific and Africa Collections	> Ruins of the Temple at Sivasamudram. At Sivasamudram the River Cauvery forms two waterfalls that plunge into a depth of 125 metres forming picturesque rapids. This drawing depicts the ruined entrance gopura or pyramidal tower of a temple situated in a densely forested hills near the falls.